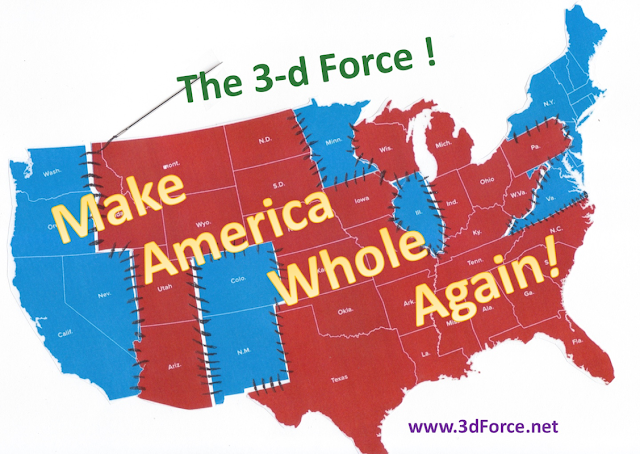 The3dForce: Make America Whole Again! The 3-D Force in politics. We all may have different reasons for that. At this point in the history, we don't even needto launch a new additional party. 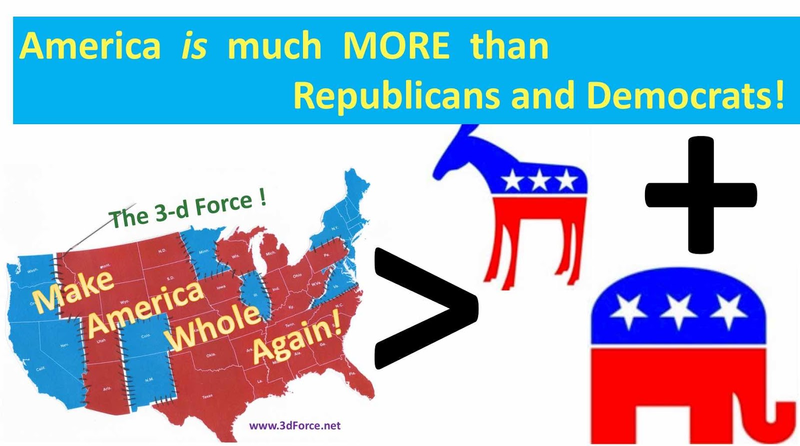 In 2016 Presidential elections 65,844,969 voters went Democratic, 62,979,984 voters went Republican, but 7,627,197 people (close to 12 % of who could have been voting for a certain party candidate; or about 6 % of all who voted) voted for a third force. Many people did not even vote at all because they did not trust neither the Republican nor the Democrats, but did not see a strong third choice. Currently, the only way to financially support he movement is through the PayPal button below (currently it is linked to my business name TeachOlogy Consulting, but I am working on setting up a campaign at www.crowdpac.com; as an amateur in setting up online business communication, this is where a professional coder could help). This link http://www.teachology.xyz/vv.htmleads to more on my professional experience. 1. Why did Hillary Clinton Lose the Race? Or. Conformism and Arrogance of The Establishment. And. What To Do Now? 5. "The True Role Of The Third Party In The U.S. In The Current Political Environment", or "What Do We Really Need From The First Truly Third Political Party?" 7. What should really differ a “Progressive” from a “Conservative”? 8. Ignoring sloppiness: a sign of tolerance or mismanagement? And how did it affect 2016 election. 9. “Being Polite” versus “Being Nice”; what is the difference for a debater? 10. Peering through the fog of brainwashing. 11. When will the Democrats make the first step of the 12-step program (admitting!)? Seems - never!